Posted September 6, 2014 by Malcolm Stewart & filed under Episodes. Which stories are more real? Those where their authenticity is proven, or the ones we have retold in our heads, where literal truth has given way to poetic meaning? It’s the single big idea at the heart of ‘Robot of Sherwood’, and if it sounds pretentious, really it isn’t. It is, in fact, as comic and ridiculous as Doctor Who has ever been. Not since the Doctor met up with Lemuel Gulliver – or, before that, with Agamemnon and Odysseus – has the programme taken such irreverential delight in pitching the Time Lord against other fictional heroes. 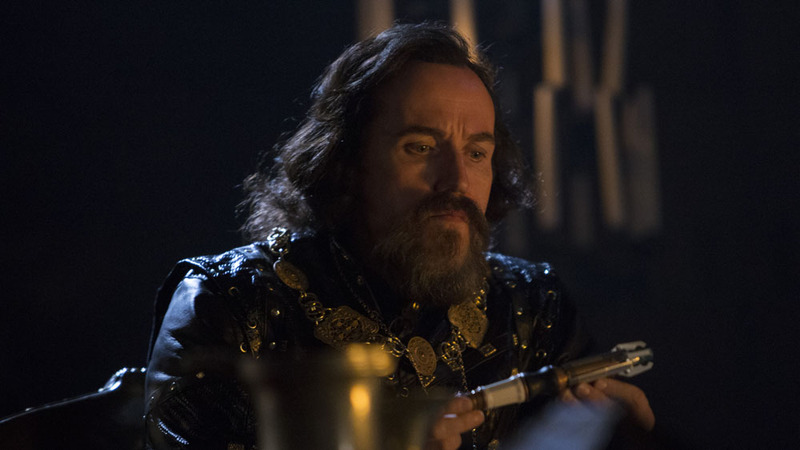 Ben Miller may star as the Sheriff of Nottingham, but it’s the Doctor who most inhabits the sardonic spirit of the famously Christmas-cancelling Sheriff. This Doctor isn’t just intrigued; he’s also personally offended that ‘It’s too sunny. It’s too green.’ If you like your Doctor contemptuous of the foolhardy and flippant, then there’s a story here to suit you. But there are other moments, other stories – and even, briefly, one other Doctor. The sequence when the Doctor is kissed by the as-yet unrevealed Marian is a beauty. The Doctor holds his hand to his cheek like a gauntlet, softly awakening the memory of something confused and tender. But the real punch-the-air moment comes earlier when, on board the spaceship, the Doctor scrolls through the faces of fictional Robin Hoods, and there, in a production still from the BBC’s first ever Robin Hood, is Patrick Troughton! Here is a story we can tell ourselves – a tale of how a Time Lord who is a once and future Merlin can also be an echo of Robin Hood. It’s a glorious knowing wink in an episode that is full of them – and who better to decipher the allusions than Clara, English teacher extraordinaire and sometime supervisor of after-school taekwondo? 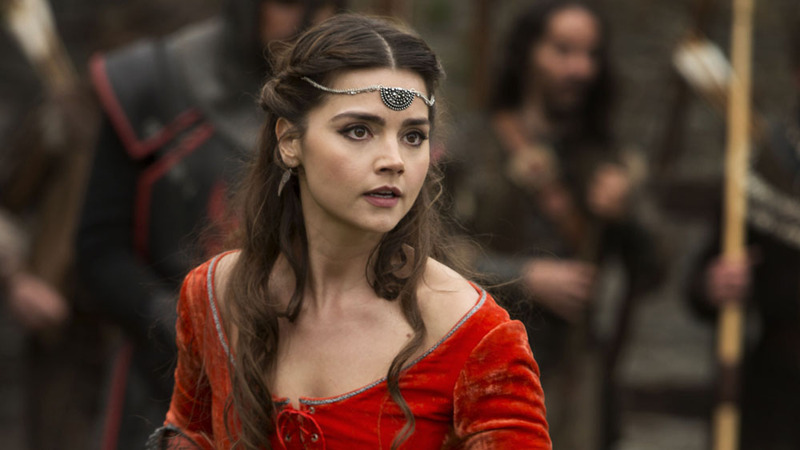 Dressed in ye olde fashion style, Clara is our über-Marian for the episode. [There’s a reason why the ‘real’ Marian has to be kept veiled until the final scene.] She’s also our compass for which truths have most value: the one character who has reawakened her childhood belief in old-fashioned heroes. When she tells the Doctor at the beginning, apropos Robin Hood, ‘I love that story. I’ve loved it ever since I was little,’ we should have known then where this was heading: should have known then that the folk hero being celebrated was not the one in Lincoln green but TARDIS blue. Yes, the clichés are plentiful, but it is a confident dance of storytelling that can honour and subvert so many clichés, while opening the doors to so many other stories too. 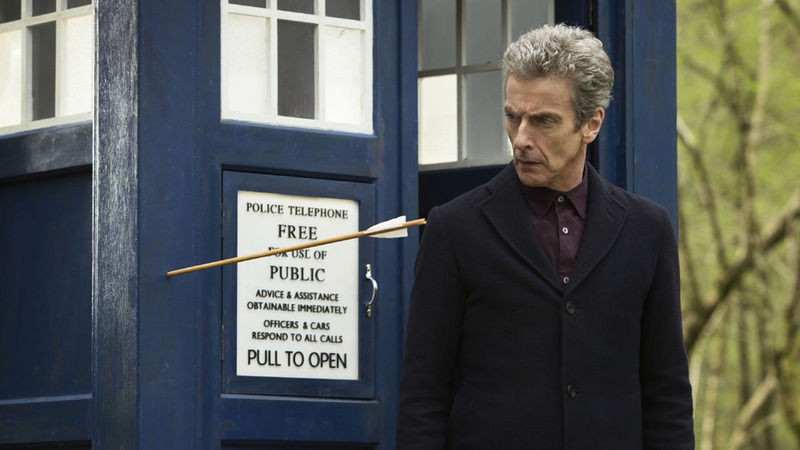 There is the tale of the Tumescent Arrows of the Half-Light – all the more pertinent given that it is a tumescent arrow which ends the narrative – and for long-time fans there is the happy confirmation, long since assumed following scenes in ‘Silver Nemesis’ and ‘The Shakespeare Code’, that the TARDIS shell is self-healing. Arrows can’t harm it! Director Paul Murphy has great fun in playing the genre for all its gleaming enchantment. Rarely has Wales in early Spring looked quite so halcyon. It’s been a while since Doctor Who has done this – the storytelling equivalent of taking the top down and driving away the winter blues. However, when Mark Gatiss wrote a story about the retelling and reshaping of stories, it’s fair to say he didn’t expect that his own script would become itself quite so dramatically bowdlerised – or in such circumstances. Nonetheless, it is a fact that for some viewers – specifically those viewers who read or downloaded the leaked episode online – there will now co-exist two versions of ‘Robot of Sherwood’. The one where the jumped-up Sheriff leads an army of robot knights or – and we find ourselves now in the unusual position of giving a spoiler warning for a scene that was never screened – the one where the teched-up Sheriff was himself half robot knight. The edit in question was necessarily tactful – on balance, the right thing to do in the circumstances. In terms of the flow of the narrative, it matters not that much: the climax is still breathlessly fun. Aired at 7.30pm on Saturday 6 September 2014 on BBC One. > Follow Malcolm Stewart on Twitter. Tried to hard and as a result missed the mark. Very disappointing. If editing out one beheading was the right thing to do, why not edit out the other beheading? Not to mention the scene where the Doctor jokes about Robin’s head being cut off. I don’t care too much about scenes being cut. But if the BBC really wanted to cut the scene ‘out of respect’ they should have done so quietly without announcing it in the press. Ok, time to draw back the curtains on the Emperor’s New Clothes, or perhaps, the Doctor’s New Clothes… This was a terrible show. This episode might seem like fun to some, but Capaldi has, up to this third episode, seemingly the least number of lines of any previous Doctor. He’s one-dimensional, one big scowl, not a hint of personality, no fun at all, and in this episode not the least bit involved in the plot. Matt Smith, David Tennant and, dare I say, Chis Eccleston would have played this script, as minimal as it was, better than Capaldi – who is quickly becoming my least favourite Doctor. 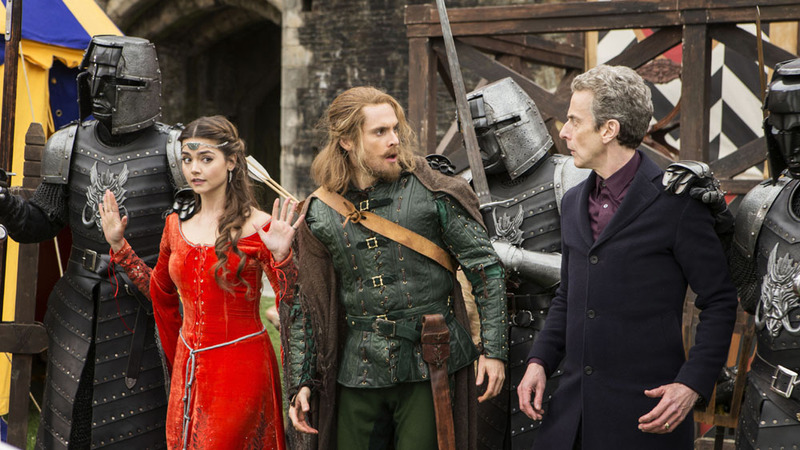 The show is becoming “Clara and the Oswalds” (or Friends and Enemies). I think Moffat has been reading, and starting to believe, his own press clippings. I hope he can turn this thing around. Judging by this third episode, the Franchise is in danger of totally losing whatever credibility it had with the close of Series 7. (Think what “Batman and Robin” did to THAT franchise!) Time to put the emphasis back on the Doctor, and less on Clara. And the writers have to get Capaldi to lighten up and show more than his grumpy side. Or maybe that’s all he’s capable of? I’ve watched this show since the late 60’s and I’ve never been this frustrated and disappointed with Doctor Who. Well said. If this is the way it is going to continue, I fear for the future of the of the franchise. I don’t think it is Capaldi’s fault that he is coming off looking so bad as the Doctor – we know he is talented – I can only assume that it is Moffat. How can we encourage him to move on to do something else before we lose Doctor Who altogether? Actually, there is a Doctor with fewer lines… the First One.. In fact there are whole episodes where is doesn’t even make an appearance. It’s a shame the whole story couldn’t have been edited out to be honest. A terrible episode on so many levels. The worst since it came back? Quite possibly. Well done Mark! I am not sure I would agree it is the worst since the series cam back. The other two episodes of this season have been hitting new lows. This one I think was marginally better than the previous two. I’m not sure why this episode has got so many bad reviews. I think it was an interesting plot. It was funny and kept me smiling until the end. I loved watching the relationship between Robin and The Doctor grow too. Also, to the people saying the plot was “ridiculous”. Hasn’t Doctor Who always been a little ridiculous? Cat nurses? Giant wasps? And more recently, The Doctor walking inside a Dalek after being shrunk??! I think the script was well written and was easy to watch with a great story line. Well done Mark! Another great episode. A thoroughly enjoyable episode – Mr Capaldi nails it! I have to agree with the other people here. This episode was not that great. The Doctor whined all the way through the episode. The robots presence is never fully explained satisfactorily, and Clara spent too much time fawning over Robin and only in one scene was she showing the pluck that you expect from a Doctor’s companion. There are holes in the plot big enough for a double-decker bus and like most of Moffat’s shows, the pace moves too fast to enjoy any semblance of atmosphere or characterisation. I must admit Capaldi was easier to understand in this episode than in the past two, and the spoon fight was a highlight. i actually really enjoyed this episode .-. So many things are going wrong with this season. Yes, it is fictional, but really – shooting an arrow at a ship and it just absorbs the gold that it needs to power it … really? The best fiction is that which one can imagine could happen – that is poor at best. I am not sure what it is with this season – Capaldi is a good actor – the writing of the episode was better than the previous two, but I think Moffat has screwed around with the basics of what the Doctor is like so much that this season seems off the mark – overall I would describes this season’s shows as lackluster. It seems that criticizing Moffat has become a wide-spread trend. Did anyone notice that this episode was NOT written by Moffat? Moffat is the showrunner now, meaning it is his responsibility to ensure that the stories made are good ones. Therefore even if this is one of Gattiss’ worst episodes to date, it is still Moffat’s fault for producing it. By contrast, Moffat used to make good stories when RTD was the showrunner, because RTD could make changes and decide if it was good enough. Overall I’m disappointed with this series. Mostly because I know if we got a new showrunner and new scriptwriters we could have something good. – Episode 1: The Doctor is totally confused and acts like a madman. Also, return of the clockwork robots we didn’t care about. Oh, and dinosaur trailer bait. – Episode 2: An adaptation of Fantastic Voyage and Innerspace, which has been done to death. Granted the inside of a Dalek is interesting and the rest of the episode was like a remake of the Ecclestone episode “Dalek”, but it wasn’t great or shocking by any means. – Episode 3: Taking a fictional character and trying to put him up as a real guy who falls into legend. I know they’ve done this in classic who but I disregard that. Keep historic fiction as that. Give us real times and people and then throw in Sci-Fi. The fact that they have the nerve to compare visiting Robin Hood with the likes of Madame De Pompadour, Charles Dickens or Bill Shakespeare during their “Doctor Who Extra” featurette makes it all the more infuriating. And that’s completely ignoring the various other flaws in this week’s episode. Thankfully though I am enjoying Capaldi’s doctor when he isn’t whining. There’s something about such a serious man having a spoonfight which made it entertaining. However, I would rather the series continue into “Adult Drama” territory than “lighthearted frolic in the woods of fluffyland”. You are correct. T-rex as big as big ben. That tells you everything you need to know about Moffat being ready for the scrap heap. The show in its current form has got to be one of the worse things on TV. it should be so much more. Although the bantering, at times, was a bit too much, I quite enjoyed this episode. I really like the new doctor, and I think the kiss he received might awaken some memories within him that might affect his personality a bit. He’s still trying to sort himself out, I believe. I did enjoy the theme of being a hero and Robin’s words to him to not let history be a burden to the Doctor. I was really looking forward to this episode when it originally aired but was seriously disappointed. Between the cliches and scripting I just felt that it fell flat. There were a few gold lines in there that I genuinely liked but most of it just made me want to turn it off. The episodes for the season just seem so….dull. I’m tired of Clara (or the companion in general) always being The Focus and the writing just seems to have gone downhill. Which is awful because I love Doctor Who and I think Capaldi could do a really good job as the Doctor if he only had some decent episodes.